Find out more about world-class supplements here! 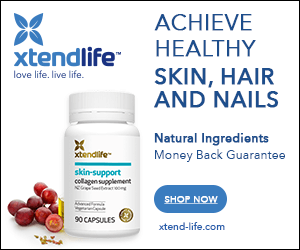 The skin care line I personally recommend, Xtend-Life's Natural Skin Care, has recently introduced a new blend of ingredients they use in many of their skin care products. It's called Kanapa™ blend and it is a breakthrough blend of eight plant based ingredients designed to effectively nourish your skin. Today I want to present to you the eight ingredients included in the Kanapa™ blend and shortly explain why together they are such a special and powerful combination. Astaxanthin is a natural antioxidant which is actually derived from algae. Combined with Copherol and Phytaminol, Astaxanthin helps to fight free radicals, thus helping to keep the signs of premature aging at bay. BioVera™ Oil is a unique plant extract is from the absolute skincare multitalent aloe vera plant. It was included in the blend to help in hydrating the skin after exposure to harsh conditions such as sun, wind or the other elements. It also supports the health of the skin and relieves irritation, regardless of skin type. Copherol is a natural form of vitamin E. As you might know, Vitamin E is a valuable antioxidant that helps resist the breakdown of collagen and elastin, the two proteins that keep our skin smooth and youthful. If you boost collagen and elastin, you can resist the appearance of wrinkles. Natural Vitamin E is generally percieved as much more effective than synthetic variations of it. Harakeke Oil is actually a kind of a flax oil, which is very high in linoleic acid (about 70%). Linoleic acid is in fact a part of the natural skin barrier. Adding extra linoleic acid on the skin supports its hydration level, as the moisture is kept in naturally. It also has effective oleic acid which help your skin cells renew themselves regularly, helping the skin stay supple and wrinkle-free. Lipolami™ is an oil derived from milk thistle and it's been included in the blend for its hydrating properties. It is wonderful to apply, and it leaves the skin feeling absolutely silky to the touch. Mamaku extract is obtained from a New Zealand tree fern which produces a healing extract that has been used by Maori for hundreds of years to bring new life to skin cells as well as soothe the skin to support health and youthfulness. Moringa oil is a very light and easily absorbed oil used for health and beauty for centuries. It's no wonder the Moringa tree is also called the ‘Miracle Tree’ and ‘Tree of Life’ by peoples all over the world. This odourless oil is absolutely packed full of antioxidants to resist free radicals and stimulate collagen and elastin in the skin. Phytaminol is another power-packed antioxidant which supports the skin’s cell health while also working hard to support circulation and supporting the skin's ability to deal with any inflammation. Together these 8 ingredients can really support the skin's natural ability to heal itself, and thereby help you reduce the appearance of fine lines and wrinkles just by using skin care products that include the Kanapa™ blend. The brand I recommend if you want to get all the benefits from this unique blend of special skin care is the Xtend-Life Natural Skin Care line, which you can buy online risk-free (they have a really good returns policy!) and and with free shipping on orders over 60$ here!